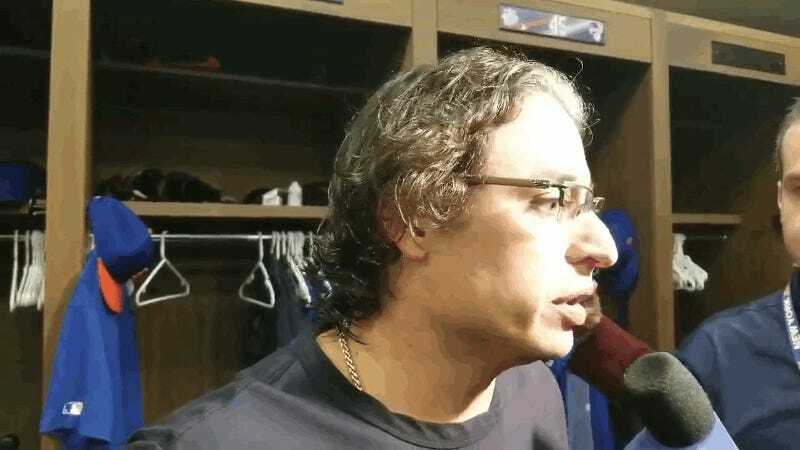 Everyone’s eyes will naturally be drawn to the colonial-seeming fellow sliding into the background of Saturday’s postgame scrum for Mets pitcher Jason Vargas. Fine, that’s understandable. This blog will get to him shortly, but there are other things to appreciate here, too. For context: Vargas had been pulled from a start after he gave up four earned runs in a third of an inning and handed the Braves a 4-0 lead. (Atlanta handed that lead right back when Sean Newcomb bled four earned runs in the top of the second and was pulled, then sent to Triple-A the following day. Woof.) Vargas, who now has a 14.21 ERA after three appearances, said he was “confused” by his performance in the Braves’ 11-7 win, but more confusing is why the Mets’ rotation includes a Brooklyn Heights dad who’s about to pick up his kids from school. That might be the root cause of the issue. Now, about that wonderful man chewing the scenery without even trying: His name’s Kevin Barnes, and he’s an Atlanta-based reporter and statistician. His online presence appears to be quite minimal. He really loves baseball.